The gift of artistic vision on the large stage of life is rare. When witnessed, it is so overwhelming few can appreciate its impact for years to come. Such was the man, Frederick Law Olmsted, the founder of landscape architecture in the United States, designer of Central Park and many other significant parks, communities, and schools. By today’s educational and academic standards, Olmsted was a “self made man” with little formal education. Raised on a farm and barely supervised by various schoolmasters, Olmsted was free to roam about the grounds and explore his grandmother’s book collection. At the age of nine, Olmsted supplemented his erratic education with consuming such works as The Vicar of Wakefield by Oliver Goldsmith and Laurence Sterne’s Sentimental Journey Through France and Italy. His curiosity for life contributed to his love of nature and adventure. His quest to learn about the world and his yearning to travel also presented him with challenges no one could have prevented him from exploring. Olmsted was a determined person whose kept his own counsel. As often the case with exceptional talent, determination and vision can override more socially acceptable characteristics. Fortunately, for us all, Olmsted’s skills and talents broke through any personality defects that could have dismantled his successes. Remarkably, New York’s Central Park was Olmsted’s first architectural landscape project. His official position for the task was as a superintendent overseeing the labor in dismantling the previous scattering of gardens throughout the city. The park project came at a time when cities were expanding quickly and an interest in the country of creating communities that are more hospitable was on the rise. The population of Manhattan more than doubled from the 1840s to the 1860s from 300,000 to almost 800,000. The demand for some open space and tranquil grounds was heightened as more people moved to the city. The dismantling and clearing of the previous 17 separate park locations was not without controversy and heartache for many. Local businesses and unwelcome manufacturing plants, such as bone-boiling plants that processed animal carcasses to create glue, to match manufacturers, inhabited most of the 700 acres of land. There were impoverished immigrants crowded into one-room cabins. Some had formed communities called Dutch Hill and Dublin Corners. All of it had to go. It was accomplished by eminent domain, the first time in U.S. history that this principle had been used to create a large park and the city earmarked money to pay off the occupants. Although Olmsted was the park’s superintendent, he had no official role at the time as a designer. Andrew Jackson Downing with his partner, Calvert Vaux, was the original force behind the park. Downing and Vaux were to submit a design for the park. In 1852, Downing died in a riverboat accident and Vaux asked Olmsted to take his place. In 1858, they entered the competition to design the park with an entry they termed “Greensward,” which was chosen as the park’s design. Vaux and Olmsted continued to partner on many projects off and on through the years as Vaux was an architect, a skill that was a perfect complement to Olmsted’s more aesthetic eye. In the succeeding chapters, Mr. Martin’s attention to detail is breathtaking. He describes Olmsted’s vision and plans with great clarity and his eye for balance. The author’s skill is exceptional as he describes Olmsted’s design with a footpath here, a willow tree there, and a mound rising to soften the landscape over there. Mr. Martin takes the reader through the painstaking political process that almost capsized the entire project as Olmsted and Vaux envisioned and was eventually approved. The reader joins with Olmsted’s life of travels, missions, and projects worldwide and throughout the United States. Olmsted put his mark on many U.S. landmarks both public and private, including Prospect Park in Brooklyn, NY, Stanford University in California, and Niagara Falls State Reserve. The entire list is profound. 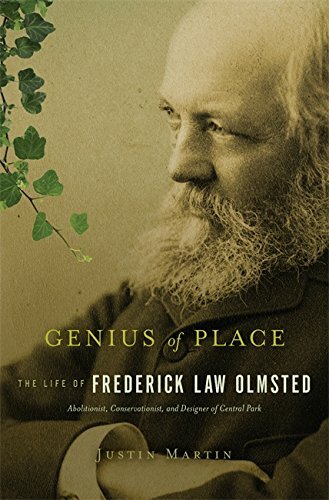 This biography is a comprehensive journal of Frederick Law Olmsted’s life written with great precision and exhaustive historical specifications; but these elements do not get in the way of a well-told tale. Indeed, Mr. Martin’s respect for history only enriches the experience of reading a biography that goes beyond the narrow life of one individual to encompass a century of lifestyle, politics, and personal relationships. Geri Spieler is the award-winning author of Taking Aim at the President: The Remarkable Story of the Woman Who Shot at Gerald Ford (Palgrave Macmillan, 2009). She is also a member of the National Books Critics Circle.